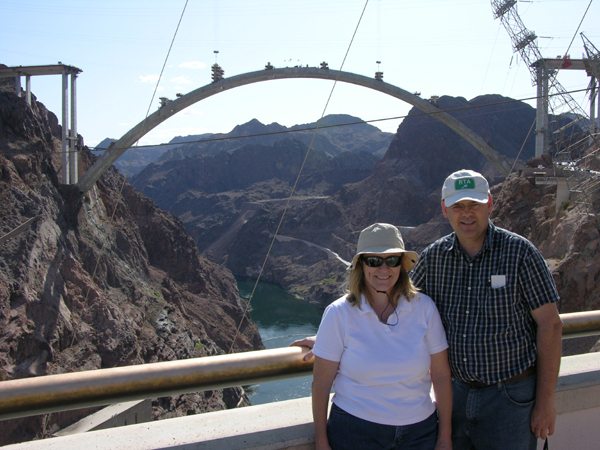 The Mike O’Callaghan-Pat Tillman Memorial Bridge opened to the public at 12:00 am this morning (midnight) and Megan Edwards and Mark Sedenquist drove across the bridge for the first time at about Noon. After you’ve looked at the extraordinary photos on this page (scroll down), click here and see what the bridge looks like from being on top! 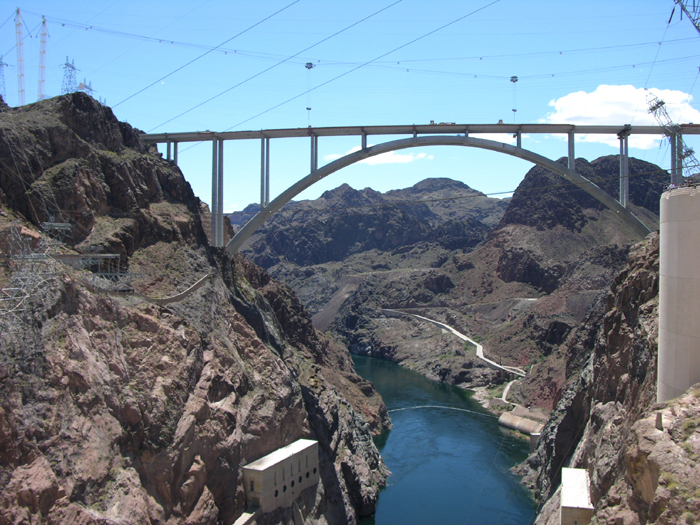 I first heard about plans to create a new bridge over the Colorado River when I moved to southern Nevada at the end of 1999. At that time, a number of possible locations were being discussed. About the only thing everyone could agree on was that an alternate truck route had to be found for the section of U.S. Highway 93 that crossed the Black Canyon via Hoover Dam. The highway had been designated as part of the North American Free Trade Agreement (NAFTA) route between Mexico and Canada, increasing the commercial traffic on the road to problematic levels. 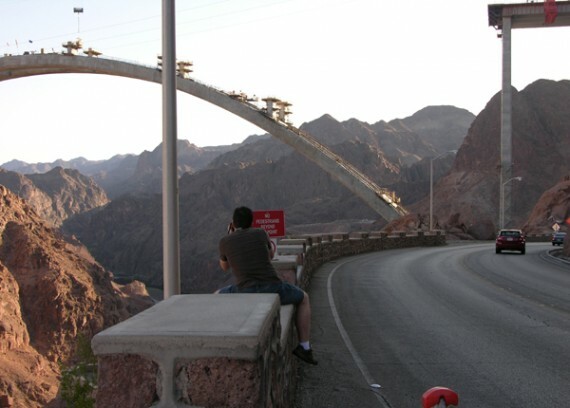 In addition, U.S. 93 has long been a major route for tourists bound for cities throughout Arizona, Nevada and Utah. 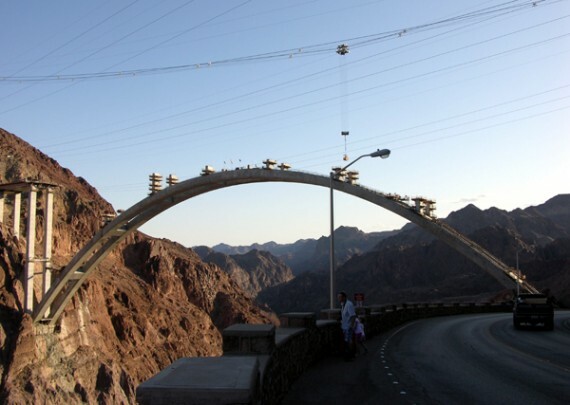 March 26, 2009: Nevada side of the arch, supported by temporary towers. Even without heavy traffic, the twisty, narrow two-lane road is a navigational challenge for trucks, RVs and even cars. 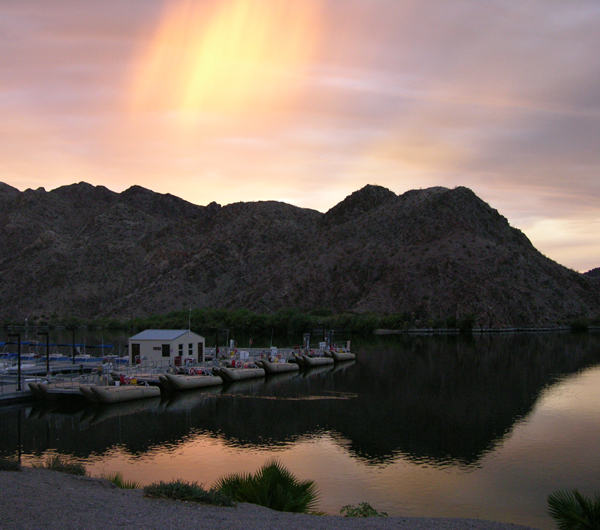 One summer evening in 2000, I was stuck in a jam of more than 500 vehicles caused when a tractor-trailer jackknifed on one of the switchbacks on the Arizona side and fell partway off the highway. To make matters worse, temperatures were brutally hot and the wind bordered on gale force. To prevent overheating and running out of fuel, everyone caught in the jam had to turn off air conditioning and engines while we waited for emergency vehicles to—slowly, very slowly—make their way across the dam and start the cleanup. The process stretched into the night, and dawn was breaking when I finally got home. 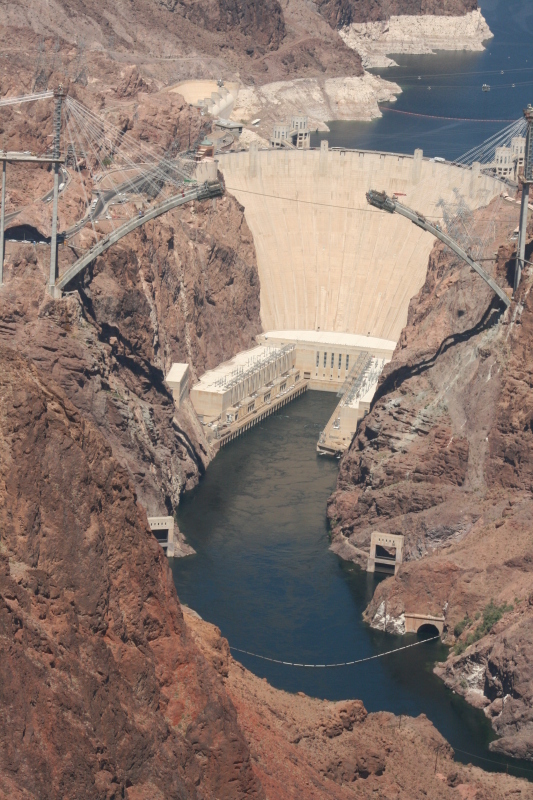 It was graphic evidence that a dam shouldn’t be pulling double duty as a major highway. Even before sabotage became a concern after 9/11, the potential dangers of a truck accident on top of the dam—and the possibility of environmental catastrophe—loomed large in the imaginations of transportation planners and emergency responders. A route known as the “Sugarloaf Mountain Alignment” was selected by the Federal Highway Administration (FHA) as the best route—at least with respect to engineering—for the new bridge. Unfortunately, this plan required the removal of a large piece of Sugarloaf Mountain, which is ceremonially important to Southern Paiute, Mojave, Hopi, Navajo and other Native American people. In particular, the mountain has played a central role in their regard for puha, the life force associated with creation and volcanic activities. The tradition is an old one, as ancient artifacts found in the area reveal. Even so, the FHA won out, and work on the Sugarloaf Mountain Alignment route began in March 2001. 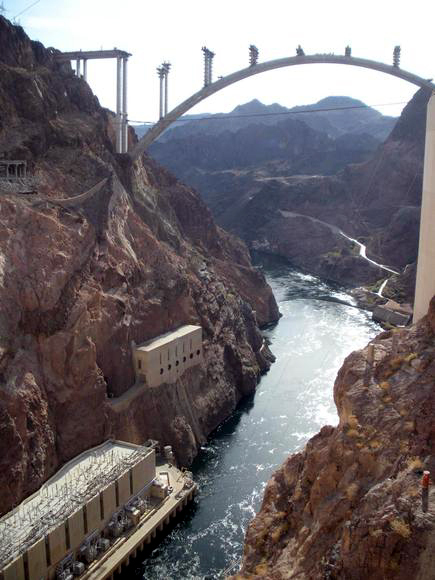 March 26, 2009: The Arizona side of the arch stretches across the Colorado River. Whether it’s the result of disturbed puha we’ll never know, but the project suffered a major setback in the fall of 2006. Two enormous highline cranes toppled over in a windstorm. 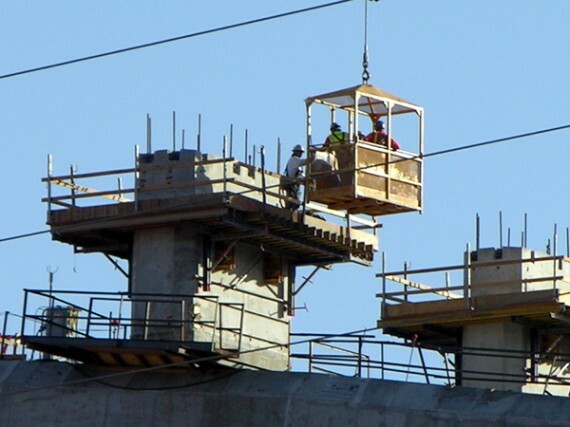 Fortunately, the event occurred while no workers were on the site, and no injuries resulted. 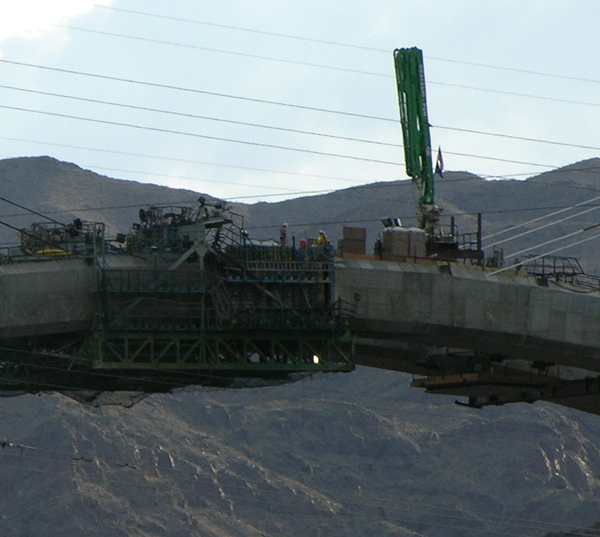 Work resumed, and at this writing, the new bridge is expected to open in late 2010. 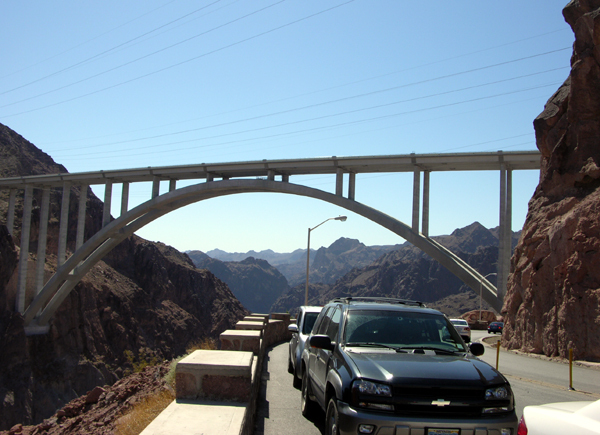 The bridge will span the river about 1,500 feet downstream from Hoover Dam and will be supported by one enormous concrete arch. 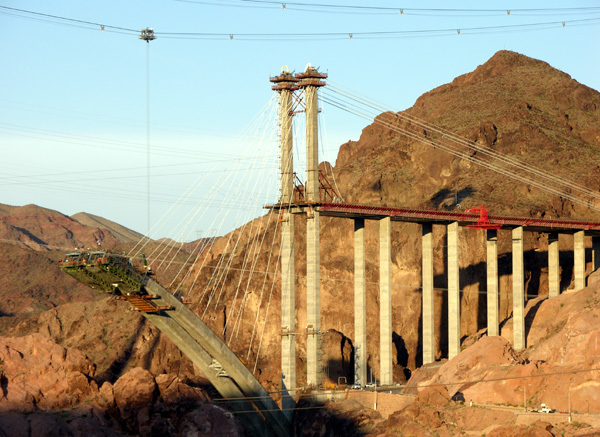 Just over 2,000 feet long, the bridge will rise nearly 900 feet above the water. 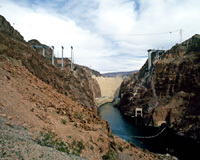 The project will require the construction of new highway sections in both Nevada and Arizona as well as infrastructure improvements to the Hoover Dam area. Total costs are expected to be around $240 million. Construction of the arch has just begun. Built from both ends, it is being formed from sequential castings of a special, high-strength concrete. When 53 24-foot-long sections on each side of the arch are finished, they will meet in the middle. 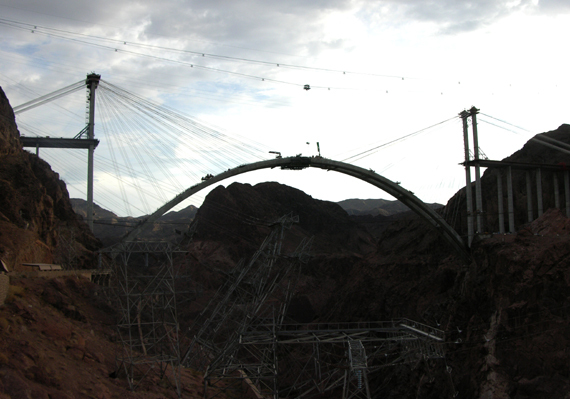 During the construction phase, the arch is being held up by cables supported by temporary towers on each side of the canyon. 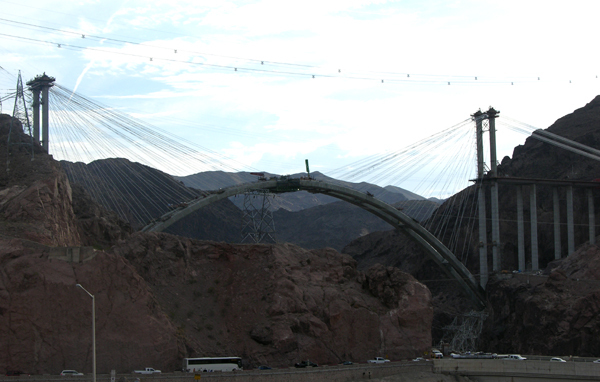 Once joined (completion of the arch is projected for September 2009) the downward force of the arch will support the bridge, and the temporary towers will be removed. Project updates are available online, and a webcam chronicles the progress. 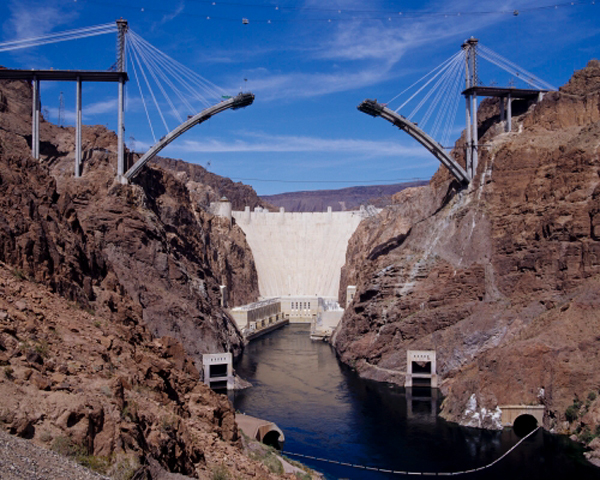 Unfortunately, the web cam can’t be linked directly from here, because the underlying software seems only to operate from within the Hoover Dam Bypass web site. However, the images are worth the time. Click here, and then click on the web cam icon (near the bottom left side of the new page) — From there you can scroll to current views of the bridge supports on each side of the gorge and also look at time lapse photos of the construction project over the last 18 months or so! Update: July 4, 2009: Here is another aerial shot that will take your breath away! 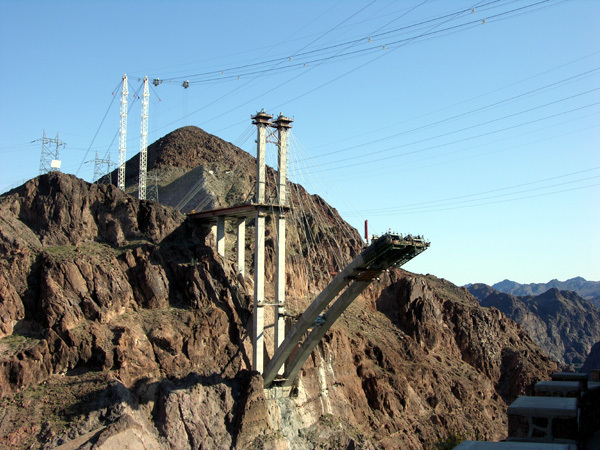 If you go to the visitors center at Hoover Dam, you can get a feel for the engineering challenges the builders of the great dam faced. But if you want a real-time appreciation for what it takes to conquer the Black Canyon, take a drive down U.S. 93 in the next few months. Enjoy a marvel in the making before it’s a fait accompli. hi that is very interesting seeing how they are coming on the bridge. Nice to see you on here — Yeah, this bridge will be a great thing for professional drivers, like yourself, when it is finished. I’ve added the Web cam links (such as they are) in the article above. They’ve upgraded the capability of the various web cams — I recommend spending some time looking at the site every so often — It’s pretty fascinating to see what’s going on out there. Wow, those are some incredible pictures! Beautiful. I’m getting vertigo just lookin at that last one. Will have to put this on my list of things to see. Nice use of my photo Mark – I’m glad I took it now!! It really is an amazing project, I can’t wait to return once it’s completed. Thanks for the use of your photo! It’s rather an extraordinary view. Maybe you’ll have to schedule a return trip in 2010 when the bridge opens to the public! As you can see in the photos I posted today (somehow I forgot I had not done this yet) of when Megan and I visited the project in early October, the two huge towers that were used to hold up the arch with these incredible support wires have been 100% removed and the smaller road bed towers that hook into the arch are under construction! The roadway construction will be underway in a couple of months. It’s moving along. I added another photo I took yesterday (April 30th). The bridge is closer and closer to being done. I hope I get to drive on this the first day it is open!